Newly-discovered evidence appears to show that John Hill Maccann made at least one performing tour to the United States. Issues of the Brooklyn (New York) Daily Eagle from 1841 to 1902 have been digitized and indexed by the Brooklyn Public Library, and these newspapers record that Maccann performed in Brooklyn for two engagements during the winter of of 1890–1891. Professor Maccann is described as appearing at Hyde and Behman's Variety Theater in Adams Street, Brooklyn, first during the week of 16 November 1890, and then again about ten weeks later during the week of 01 February 1891. This timing strongly suggests that the two appearances close to New York City might have been near the beginning and near the end of an American tour. It would be interesting for anyone with access to archives of newspapers from other large North American cities to look at theatrical listings during that same period (November 1890 through February 1891) to see where else Maccann appeared in North America, on the circuit of variety theaters, vaudeville, and music halls—which extended into Canada as well as the United States. Further notices will be gratefully received and added to this page. So far, the clippings from the Brooklyn Daily Eagle which indicate a North American tour by Maccann are backed up only by a notice in the New York Times for 27 January 1891. All the extracts located in both newspapers are reproduced below. For the Brooklyn Daily Eagle, an entire newspaper page is provided for context (in PDF format); the entire newspapers for every date can be found (also in PDF format) on the web at The Brooklyn Daily Eagle Online. The New York Times has put its archives on the web at New York Times Article Archive 1851-1995. “ HYDE AND BEHMAN'S THEATER. “ HYDE AND BEHMAN'S. THIS WEEK. New York Times, Tuesday, 27 Jan, 1891, page 4, "Amusements"
“PROFESSOR MACCANN, the celebrated concertinist, has brought back with him from America a fine medal, which became his property by a rival musician, Amducas Vestman, failing to meet the Professor in a concertina contest for the championship and $300. 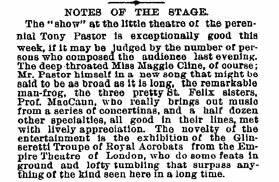 ...” From The Era newspaper, London, 2 May 1891.